HEATHER BLOOM BY ALFRED KIRBY. THE HAPPY TRAMP BY ALAN MIDDLETON. 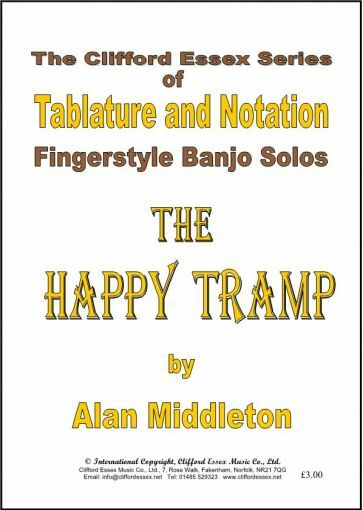 Location: /Sheet music/Fingerstyle Banjo/THE HAPPY TRAMP BY ALAN MIDDLETON. This solo is intended to give the impression of a carefree tramp whistling happily as he ambles along a country lane, slowing down and stopping every so often to have a closer look at the things he is passing, — flowers in the hedgerow, birds in the trees, and all the things which go to make an enjoyable sunny day away from towns and cities. The piece should start quietly, with the tramp in the distance and, as he approaches, the volume should increase, but die away again towards the end. Finally, we hear the short flourish of his whistle as he disappears around a bend in the lane. We can either send you a hard copy of this music, printed on high quality 120 gsm paper, price £3.00 post free. Or we can email you a downloadable file, price £1.30, and you can print the music yourself. Please choose in the options box located at the bottom of this page. 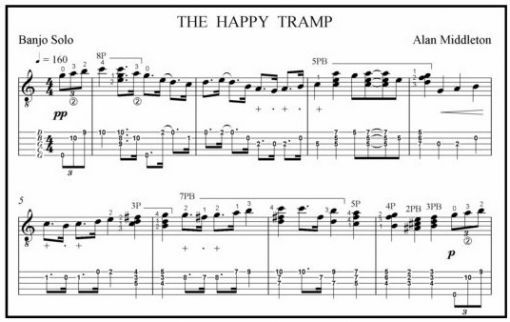 In an effort to make our sheet music affordable to all, we have made all sheet music post free, worldwide. This is a facility we would like to retain. We ask that if you are ordering music from outside the United Kingdom please order at least two titles. Astute players read BMG magazine. STEP LIVELY BY JOE MORLEY.